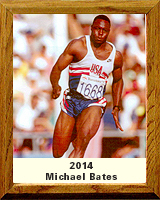 With all of the honors and records Michael Bates compiled during his athletic career, perhaps the best came when he was named the “Top Athlete in Tucson History” in 2012 by the Arizona Daily Star. Bates was a two-sport star at Amphitheater High School and was named the second-best prep football prospect in the country by the Long Beach Telegram. Bates attended the University of Arizona and in 1990 returned a kickoff 97 yards for a touchdown against Washington State. He averaged 23.7 yards on 45 kickoff returns during his UA football career. Bates used that speed that made him such a dangerous kick return specialist to win both the 100 and 200-meter dashes in both the 1989 and 1990 Pacific-10 Conference championships, earning Outstanding Male Performer both years. Bates anchored UA’s 400-meter relay team to a second place finish in the NCAA Championships. His best collegiate time for the 100 meters was 10.17 seconds. Bates spent 11 seasons in the National Football League with seven teams, earning Pro Bowl honors five times and was an All-Pro selection five times. He was the NFL Kick Returner of the year in 1996 and was named to the All-Decade NFL team in 1990. He amassed 9,100 yards on 373 kick returns during his NFL career, including five touchdowns. He holds five Carolina Panther records for kick returns – yards (5,987), touchdowns (5), kickoff returns (233), single season kickoff return yards (1,480) and single season kickoff return TDs (2). Bates qualified for the 1992 Olympic Games in Barcelona. He won a bronze medal in the 200 meters from the inside lane with a time of 20.38. Bates is now living in Oro Valley and training athletes at Ironwood Ridge High School and working with individual clients.